Thanks for sharing the video, excellent stuff. The creator posted it on youtube, how ironic! Yeah, i know what it's like! "If there was the option not to disrupt and innovate the market, but to follow the market, what do you do?" I think this is the google success question! Although there's no sign of the heralded "Don't be evil," What's wrong with what they actually say? 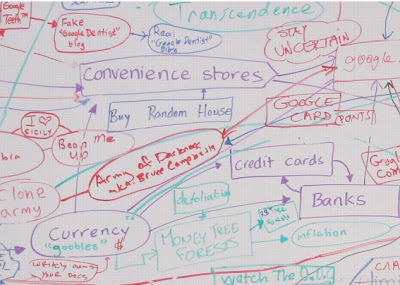 Although I think the whiteboard is less accessible and universal than a splashy propaganda video, it says mountains more about what Google's actually up to. I'll reserve judgment till the google cookie expires (2031?) and yes, I'm fully aware that this blogger page is being indexed. The version of Google's masterplan is the video! Whiteboard presented equals panic, a way of loosing the balance...!There is nothing wrong to what they say ("don't be evil" phrasis). If you are wondering what about American justice, what about secrecy and defence, what about global agents and mutiple security systems, what about ethics, this is the missing key to the puzzle, named INVERSION! Even with detailed information about our genetic information (which is already out there, in the universe, actually known by the universe, generated by it and unknown to us!) there is something about the human spirit, or condition, something that echoes the universe in expansion: the more you dig, the more you scan, the further there is to go. A sense of distance without limit, and without end. How can you catch an intuition, which to me seem to be the fuel that really composes all of us? I think that Google and its “Master Plan” on the current integration of the world's information and therefore of us, user of this information is challenging our very notion of privacy, of individuality and of intimacy. It is asking the ancient question of the place of man in the city that Plato also ask in his time. And I think that question will never have one single answer. This is probably time for us to ask the question again, for our time and see what comes up. I do believe that the more we show and share about ourselves, the more something that is "un-catchable" "un-scanabble" remains that way, and even expand. There seem to be no efficient way to transform that part of mystery in us, into something you could read about one day in Wired or Hello Magazine. I am not saying that we should just open our books and private gardens to anyone, just that the reflection on privacy and personal information raised by this clip needs to be reframe in a context where our reference to those notions are becoming increasingly obsolete or at least seriously challenged. Here is a first path for a constructive question/exploration, how do we protect the individual and his freedom, in a world of profound integration of the information and of unedited knowledge dissemination?